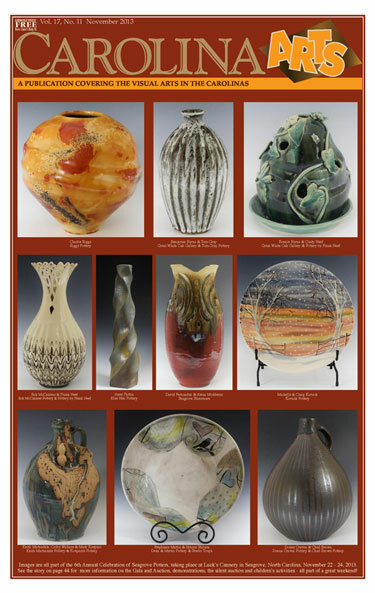 The November 2013 issue of Carolina Arts is up on our website at (www.carolinaarts.com) – all 78 pages of it. Fall is in the air and although it’s time to be outside again, (raking leaves) we hope you’ll spend some time downloading our paper and send the link to download it to your e-mail, Facebook and Twitter friends. Last month we got 289 new “Likes” on our Facebook page, which would be nice to repeat or exceed this month. We’ll be at 1,800 total “Likes” by the end of this month. I hope. We also saw a new record of downloads of the paper at over 214,000. Holy cow! So download that PDF and dig in – it makes for good reading and shows that you have lots of opportunities to enjoy the visual arts in the Carolinas in November before the holiday take over our lives. And, don’t forget to find a way to thank our advertisers – they make the paper possible.